The first comic books were simply collections of newspaper strip reprints which were offered as premiums or sales incentives, sometimes with newspapers, sometimes as free gifts with other items. The first of these was the Famous Funnies comics. 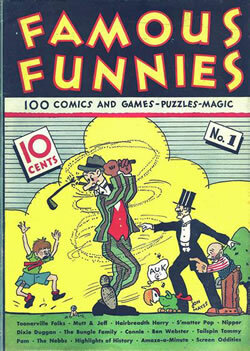 Then in 1934, copies of Famous Funnies with a 10c sticker were put on a newsstand. The copies sold out and the comic book industry was born. The first comic to contain all new material was New Fun (1935), which eveolved into DC Comics' Adventure, which ran until the 1980s. 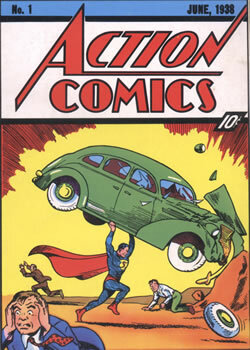 But DC's first smash hit was Action Comics (1938), starring Superman. 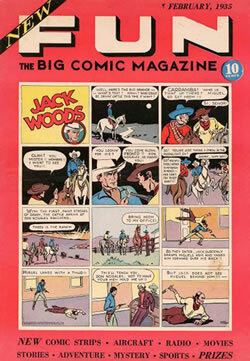 The first issue of Famous Funnies that was officially distributed on the newsstands, and the archetype of what would become the accepted format for American comic books for the next fifty years. Hugely influential, this is the comic that arguably started it all. Action Comics 1, featuring the first appearance of Superman, pretty much kick-started the comics industry and single-handedly invented the superhero genre, the backbone of the business for 65 years.